Sleeves require you to remove your shoe and slide the brace over your foot. Fits more snugly and stays in place. Once it's on it's requires little adjustment. The negative of a sleeve is it doesn't work well over pants. Wraparound braces are easier to apply especially for those with less hand strength and can be worn over thin pants. The velcro can be tightened or loosened for a more adjustable fit. Great for users who can't bend over as well and have trouble getting a sleeve on or off. The negative of a wraparound brace is the velcro can loosen during activity requiring a quick tightening of the Velcro. Neoprene has a more compressive and warmth capability than Spacer. The Spacer material is ideal for patients who have allergies or irritations to Neoprene or live in warm weather climates. Is the Playmaker II right for me? For mild to moderate ligament strains, Playmaker II provides the stability needed and comfort required when participating in daily activities. Even mild ligament strains can bring activity levels to a halt. Playmaker II issues the stability needed and the comfort required to empower movement. Playmaker II is the right move, so get your move on! 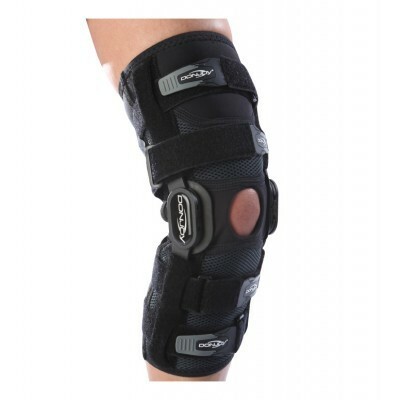 Provides support for hyperextended knee, ACL, MCL, and LCL instabilities caused by injury.